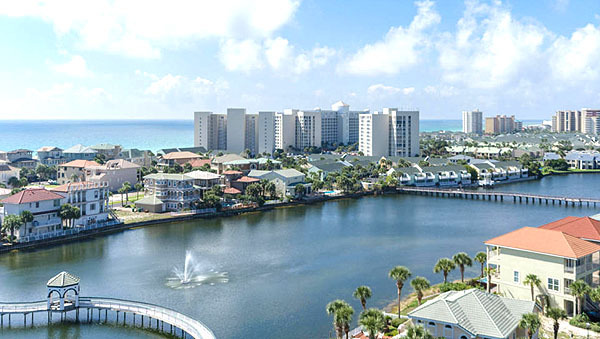 The Resorts of Pelican Beach is another great vacation community in the middle of all that Destin offers, from fine dining to endless entertainment and nightlife. Pelican Beach is a gated property offering one, two and three bedroom condos with exquisite views. It was built in 1998, consisting of two towers - The Resort and Conference Center, and the Terrace. Owners or guests have access to the amenities of both. 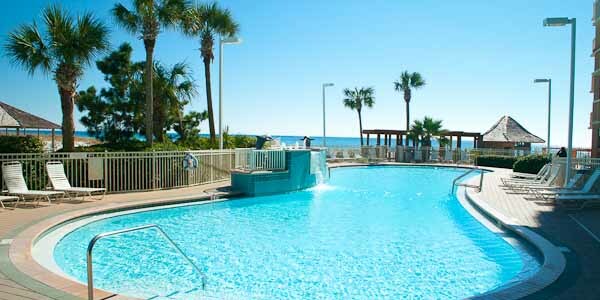 You will find three adult pools - a beachfront community pool, the Terrace's heated pool on the lake, or an indoor/outdoor pool in the Resort building. Enjoy the hot tubs in the cooler seasons, and small children have a kiddie pool. Two tennis courts will please the activity minded, as well as two fitness facilities, one in each building. A video and game room will further occupy the kids after pool time, and outdoor grills will help keep the evening meals as relaxed and easy as can be. The on-site restaurant and bakery, Chan's Market Cafe, takes care of breakfast, lunch and dinner on the weekends during the summer season. The Pelican Tiki Bar at the beach keeps your whistle wet while you enjoy the sun and surf. Both are open from the beginning of March through Labor Day. Rentals of chairs, umbrellas, kayaks, and boogie boards are available on the beach seasonally as well. The Resort and Conference Center's 19-story tower offers 340 one and two bedroom luxury condos ranging in price from well under $300,000 up to $500,000, depending on size and whether they are direct gulf-front or beach view units. The Terrace's tower of 95 condominiums has units with gulf views or city views and sits directly on a natural lake accented with colored fountains and tropical landscaping. Condos in the Terrace offer more spacious two and three bedroom units and are more affordable than the Resort tower. Prices range from around $250,000 for a large two bedroom to $350,000 for a huge three-bedroom with two bathroom units. 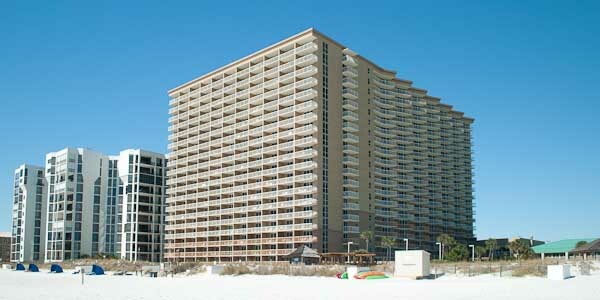 These are some of the best deals in vacation real estate that Destin has to offer. Let us show you this excellent resort property, and you may decide this is the permanent vacation home you have always wanted.